Official statistics are the “crown jewels” of a nation’s public data. They are the empirical evidence needed for policy making and economic research. Statistics offices are also among the most data-savvy organisations in government and often have a strong history of publishing data in electronic form. There is hardly any analytical task involving government data that doesn’t require some statistical data, such as population figures or economic indicators. At the same time, the handling of statistical data as Linked Data requires particular attention in order to maintain its integrity and fidelity. 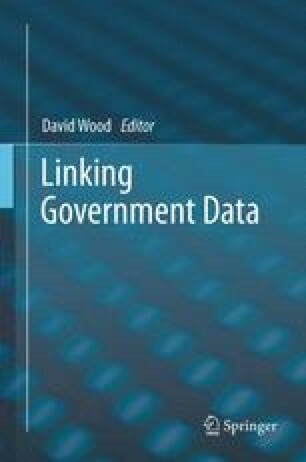 This chapter gives an introduction to the field of official statistics, discusses the modelling of statistical data in RDF including its integration with other kinds of government data, tools for data conversion and publishing of statistics as Linked Data, and methods for using statistical data in queries, reports, and visualisations. Fundamental Principles of Official Statistics. http://unstats.un.org/unsd/ methods/statorg/FP-English.htm. Statistics Finland: Producers and publishers of statistics, 2010. http://www.stat.fi/ tup/tilvir/index_en.html. SDMX Information Model: UML conceptual design. Sdmx 2.1 technical specification, SDMX Initiative, April 2011. http://sdmx.org/wp-content/uploads/2011/04/SDMX_2-1_SECTION_2_InformationModel.zip. StatsWales: Report number 003311, 2011. http://www.statswales.wales.gov.uk/TableViewer/tableView.aspx?ReportId=3816. Berners-Lee, T. Linked Data–Design Issues, 2006. http://www.w3.org/DesignIssues/LinkedData.html. Davidson, P. Designing URI Sets for the UK Public Sector. A report from the Public Sector Information Domain of the CTO CouncilÕs cross-Government Enterprise Architecture, Cabinet Office, October 2009. http://www.cabinetoffice.gov.uk/resource-library/designing-uri-sets-uk-public-sector. Hausenblas, M. Linked Open Data star scheme by example, 2010. http://lab.linkeddata.deri.ie/2010/star-scheme-by-example/. Isaac, A. and Summers, E. SKOS Simple Knowledge Organization System Primer. W3C Working Group Note,WorldWideWeb Consortium, August 2009. http://www.w3.org/TR/skos-primer/.